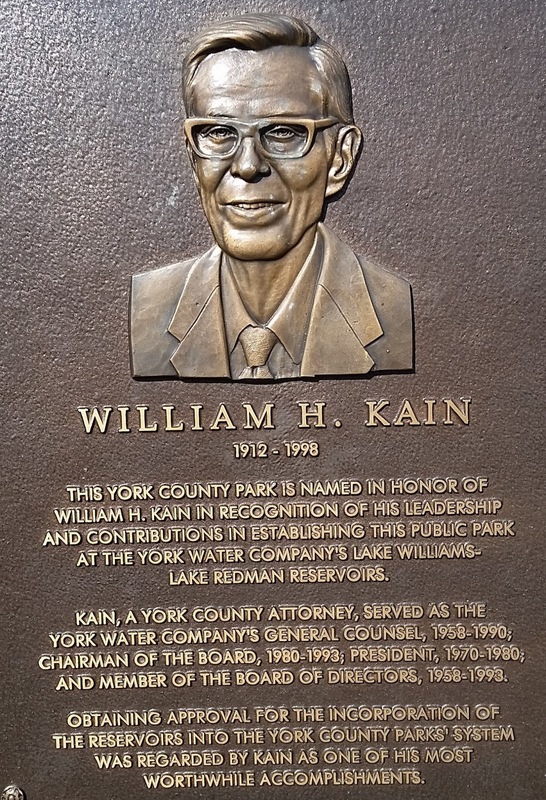 William H. Kain (1912-1998) was a nationally known York County lawyer. He is best remembered for his work as the president of the York County Water Company which supplies water to half a million people in South Central Pennsylvania. In an effort to allow the use of Water Company Reservoir lands for county park purposes an agreement was struck between the York County Parks and the York Water Company. 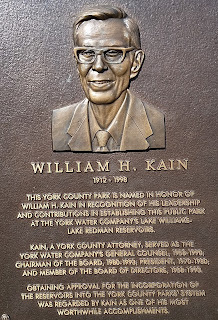 The result was the creation of William H. Kain County Park in 1977. 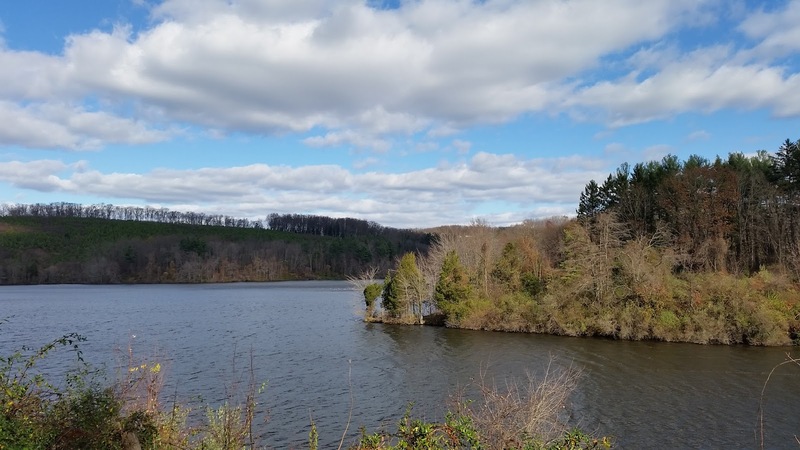 The park, consisting of two lakes, Lake Williams and Lake Redman, covers over 1600 acres and is enjoyed by nature lovers of all kind. 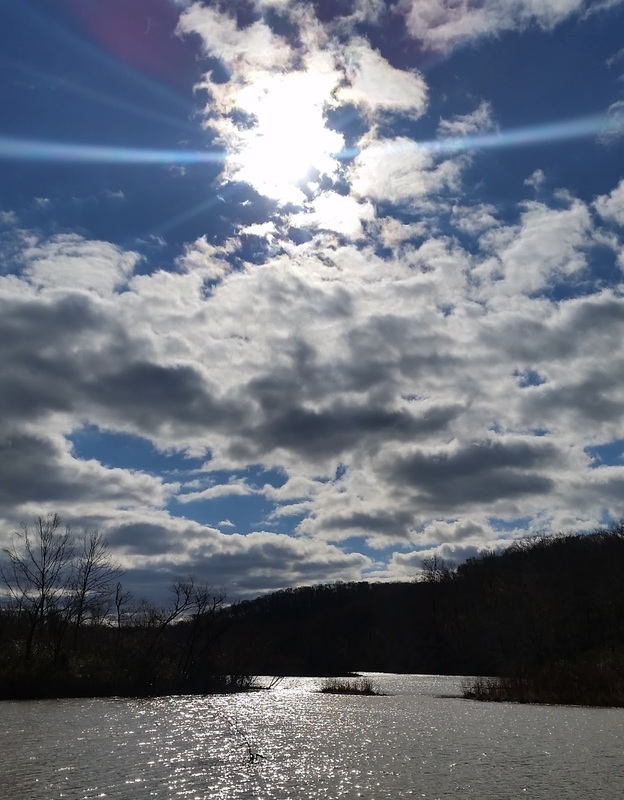 It was the perfect place for Tim and I to ride on a windy and cool November day. Parking at the dam on South George Street, Tim and I headed towards the twisty trails that loop around the backwaters of Lake Redman. The trails on this side of the lake are so much fun but I don't get over here often as I would like. In the late spring and summer they are flood prone and overgrown. Today, they were perfect. Coming out of the boat dock and pavilion area, Tim and I took a quick trip down Hess Farm Road and then turned into the trail head after crossing the Lake. To me, the most interesting part of all of these trails is that I can see that I am riding over the foundations and porch stoops of old homes. I truly am a nerd...and I wonder who once lived there. In the spring daffodils still bloom around some of these porches. Amazing. As Tim and I cruised along, my peripheral vision caught a glimpse of the walking deck that juts a few feet out into the lake. I've seen the deck many times but I never checked it out. From the trail, I assumed the deck was only a few feet long. To my surprise, it stretched about 100 feet and provided educational signs explaining the water cycle and plant and animal life in the area. So cool. Coming out on Iron Stone Hill Road, Tim and I turned up a long double wide trail that looped across South Pleasant Avenue and connected onto Trail #5. When mountain biking I completely prescribe to the idea of maximizing my fun. The incredible downhill that leads back to Iron Stone Hill Road brings a grin and smile to my face the whole way down...and it makes grinding ride up more than worthwhile. 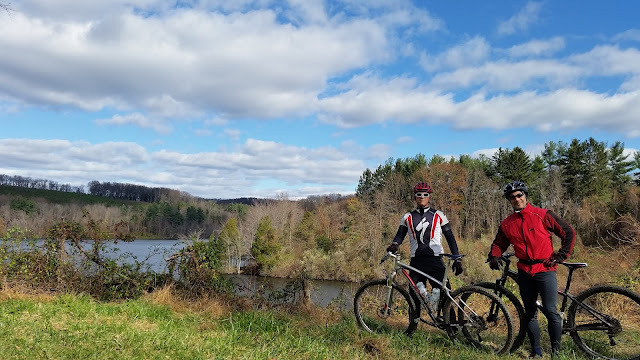 Doubling back on Iron Stone Hill Road, Tim and dropped into a section of trail that winds and turns and squiggles around a flood prone area of the park. 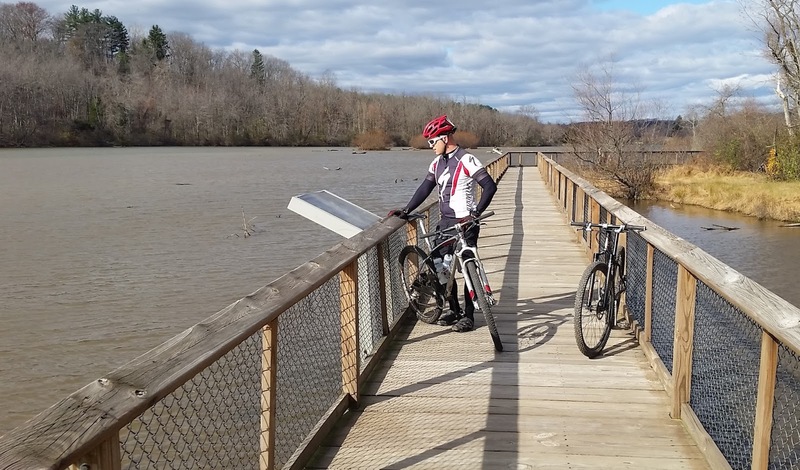 A few bridges, covered with chicken wire for traction, and gravel, which has been strategically dumped along a few sections of the trail, makes the area easier to navigate. Trail #5 then heads back towards Hess Farm Road on a ridge above the lake. The short, quick ups and downs of this trail make it one of my all time favorites. Normally, Tim and I would ride through a tunnel under Interstate 83 in order to get back to the boat dock area of Lake Kain. That tunnel, however, has a creek that runs through it. In the summer, we don't mind getting wet feet. Today...not so much. Turning down towards the lake we rode back to Hess Farm Road to avoid the tunnel. Coming through the pavilions and parking area around the boat launch area we passed the Kain Memorial. How is it, that all the years I've been riding here, that I've never noticed this? Dedicated in 1987 by members of the York County Students Against Drunk Driving, the memorial stands in remembrance of York County victims of alcohol and drug related crashes. It contains the names of 68 victims of alcohol and drug related crashes in York County since 1980. It stands in the HOPE that the monument will help others choose NOT to drink and drive. Once we got back to George Street, Tim and I crossed the road and did a short little section of Trail #4 that brought us down towards the lake and back out to the road. Just the cherry on top of a fantastic ride. 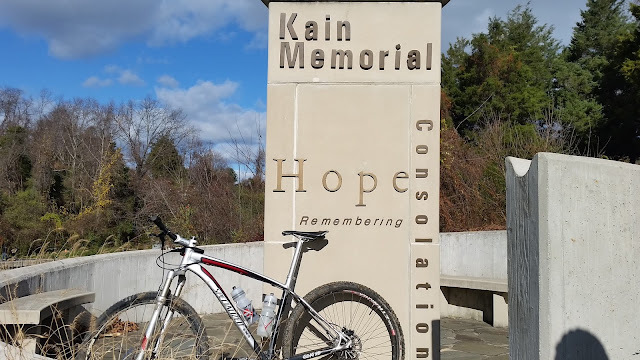 It was a great day to be out on the bike today enjoying life, nature, the company of a good friend, and the gift left behind by a man named William Kain. 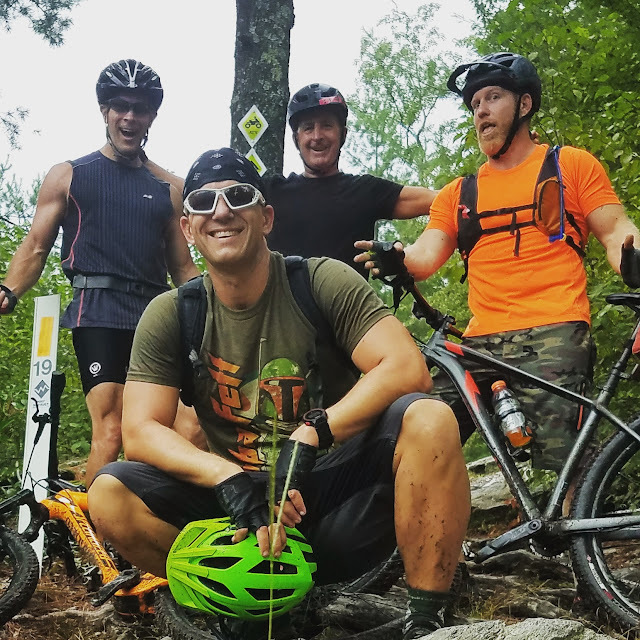 Be sure to check out the website for ALL TRAILS LEAD TO ICE CREAM and take a look at past entries, ride pics, trail maps, and so much more!